It’s been said that every musician wants to be a filmmaker and every filmmaker wants to be a musician. 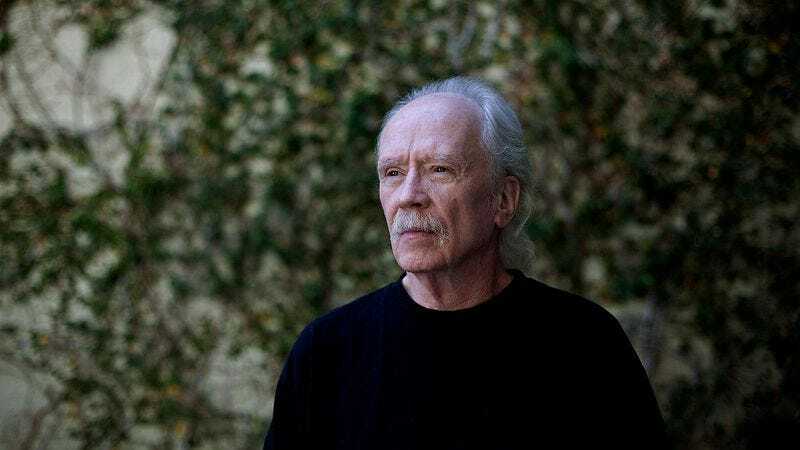 John Carpenter has been doing both for over 40 years, taking on writing, directing, and composing duties for most of his films. Carpenter is currently playing rock star, on tour promoting his two Lost Themes records, playing rearranged versions of his classic film themes to sold-out audiences around the world. In 1985, the horror master recorded an album’s worth of material alongside Nick Castle (the original Michael Myers) and Tommy Lee Wallace, who worked as production designer and editor on 1978’s Halloween before going on to write and direct the Carpenter-produced Halloween III: Season Of The Witch. Recorded as The Coupe De Villes, Waiting Out The Eighties was never meant to be officially released and only given out to friends and family. Well, one of those friends and family must have dropped it off at the local record store when they were switching over to CDs because YouTube user TGRT91 has uploaded this gem of a record for your listening pleasure. The album kicks off with Nick Castle taking on lead vocal duties on the New Wave-esque title track with film composer—and frequent Carpenter collaborator—Alan Howarth sitting in on bass. The album credits Tommy Lee Wallace with lead guitar and Carpenter with bass, rhythm guitar, and the bulk of the synthesizer tracks, with all three musicians switching off on lead vocals. Carpenter’s bluesy register is probably the most noticeable, as he sang on the band’s theme song to 1986’s Big Trouble In Little China. 1967 shows off that intangible Carpenter touch, feeling like a lost theme to one of his films with its moody synths and drum machine. Carpenter also takes lead on Friends In L.A., which is a very Hotel California-era account of the City Of Angels with soaring hooks and sweet harmonies. Castle’s “Manhole” is full of slick rockabilly hooks and tossed off, silly lyrics. Most of the album’s content is typical classic rock ’n’ roll, chock full of call backs to the songs that these guys grew up on, from Book Of Love to “Lonely Teardrops.” Wallace’s sole lead vocal contribution, “She Doesn’t Want You Anymore,” is a moody tale of love gone wrong that recalls Bruce Hornsby with a terrific guitar outro. The production on the record is very sparse and effective, just like the horror master’s film score. One has to wonder what would have come if T Bone Burnett had gotten a hold of these demos in 1985 and produced a neon-Americana record, drenched in echo, tremolo, and chorus pedals. Carpenter and Castle’s “Really Need You” is certainly influenced by John Hiatt’s “Have A Little Faith” with a hint Southern fried gospel, while “Hollywood” is pure Los Angeles yacht rock with shades of Harry Nilsson and Warren Zevon. Carpenter has stated that Coupe De Villes were a product of a time and place, so don’t count on a re-release or a reunion. For now, they’ll simply be answers at your pub’s trivia night (the band’s music is featured in both John Carpenter’s Halloween and Nick Castle’s The Boy Who Could Fly). The album is certainly worth a listen, with 12 great pop songs by three guys who can also scare the pants off you.